Advertising: Where Should You Focus Your Energy? Ever heard that saying about how you should look to the past to figure out what lies ahead? Believe it or not, doing this can also help you prepare for the future of advertising. Without a doubt, advertising has a rich history of its own and has followed numerous trends over time. Each of these changes led to more revolutionary ideas, eventually leading us to where we are today. As advertisers, it’s important for us to understand the past and current trends of our field so that we can prepare for the future. In the 19th and 20th centuries, most public advertisements consisted of very lengthy body copy and overly crowded visuals. 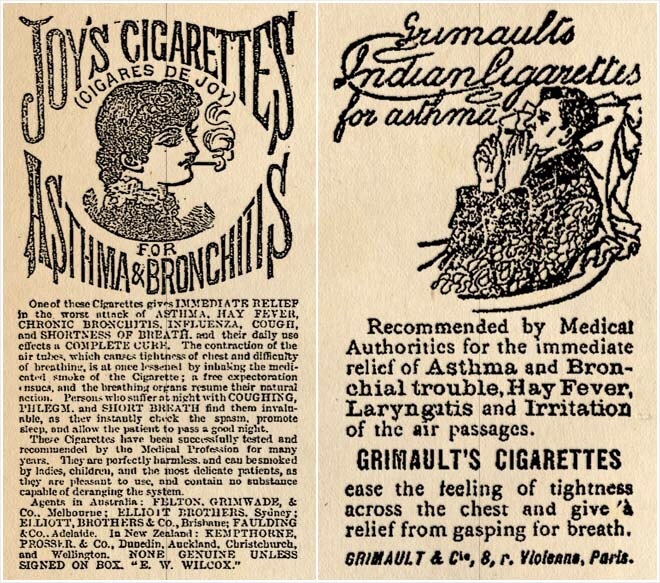 Take for example, this ad from the late 19th century promoting cannabis cigarettes. It is obvious why this style of advertising soon evolved- who wants to spend 10 minutes sifting through information to make a decision on a product? Roughly 50 years later, we saw another form of advertising take hold. The first TV ad was released in 1941, before a televised Phillies and Dodgers game. The ad was only a couple seconds long and consisted of a still graphic with the purpose of bringing awareness to the brand. This kind of ad would be much too boring for our modern day fast paced society, so it wasn’t very long before TV ads turned into what we see today. TV advertisements remained the most expensive ($178 billion) form of advertising until 2017, when digital ads racked up an unbelievable $209 billion. Before long, and probably due to lack of success, ads became more image based and contained slogans as opposed to long body copy. There was a noticeable balance between imagery and words, and marketers become more experimental with layouts. Advertising had become very straightforward at this point, and it no longer required consumers to spend more than a couple seconds to make a decision on a product. After major events like WWII, advertising shifted to take on a younger voice and greater sense of optimism and creativity. 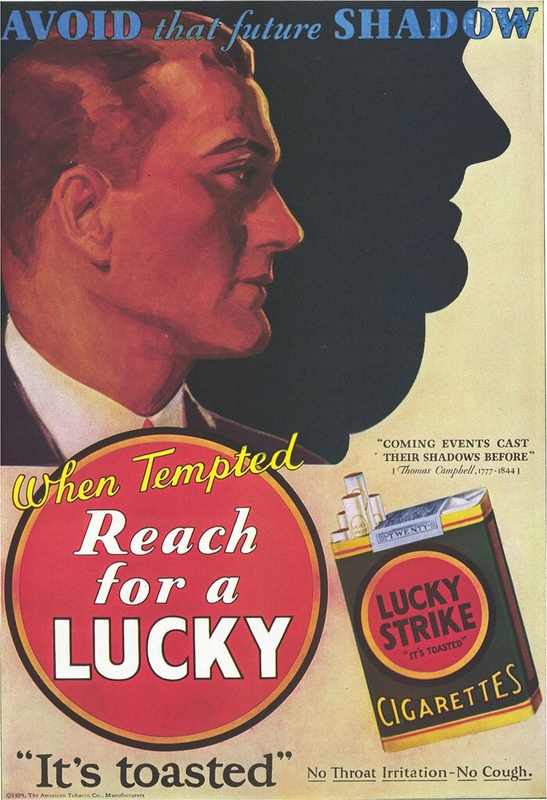 Consumers were tired of negative and intimidating advertisements like the hundreds that emerged at the time of war. They were looking for a brighter future, and this was reflected in a lot of middle 20th century ads. Take, for example, this Coca Cola ad from 1945. 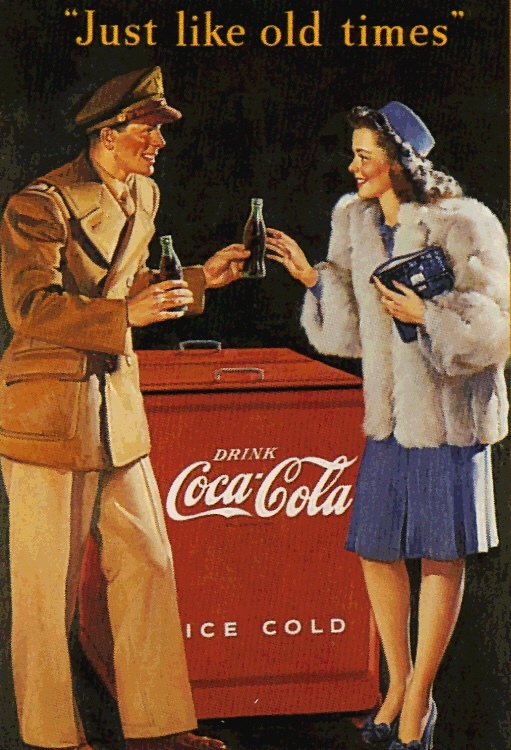 The ad radiates happiness and speaks of a time before the war when everything was better and you could just sit down and enjoy a coke. A very successful marketing strategy that started in the 60’s was to attach characters to a brand. These characters were often built around products in order to connect the viewer and the brand. 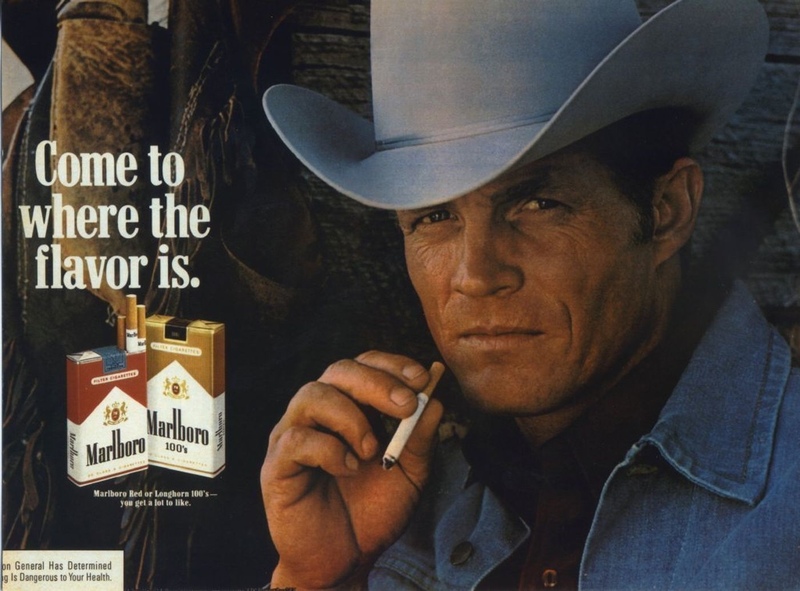 Strong examples of this are the Marlboro Man and Tony the Tiger, which have both remained industry leaders for more than 60 years. As if advertising hadn’t already become diverse enough, the invention of the internet changed everything we knew about advertising. Ads were no longer made to just sell to a couple thousand people in the states, but rather, to sell to hundreds of thousands across the world. The potential for this new medium was, and still is, absolutely endless. Unfortunately, advertising on the internet quickly turned into banner and pop-up ads, and consumers were annoyed by this form of invasive marketing. This led to a major shift of focus in the advertising world. Instead of selling a product, advertisers are tasked with bringing in brand awareness and building the respective communities of a product or brand. With such a wide range of options you can buy from nowadays, some businesses struggle to establish their brand as reliable and high-quality. A study by Forbes reflected that more than 33% of consumers browsed blogs and social media before purchasing, because they didn’t trust the product until they heard a review from another person. Advertisers have noticed this trend and put forth something called a user generated campaign, where consumers post the product they bought with a specific hashtag on social media. This allows other potential customers to see and gravitate towards the product. This lesson that people trust other people, not brands, still holds true today. 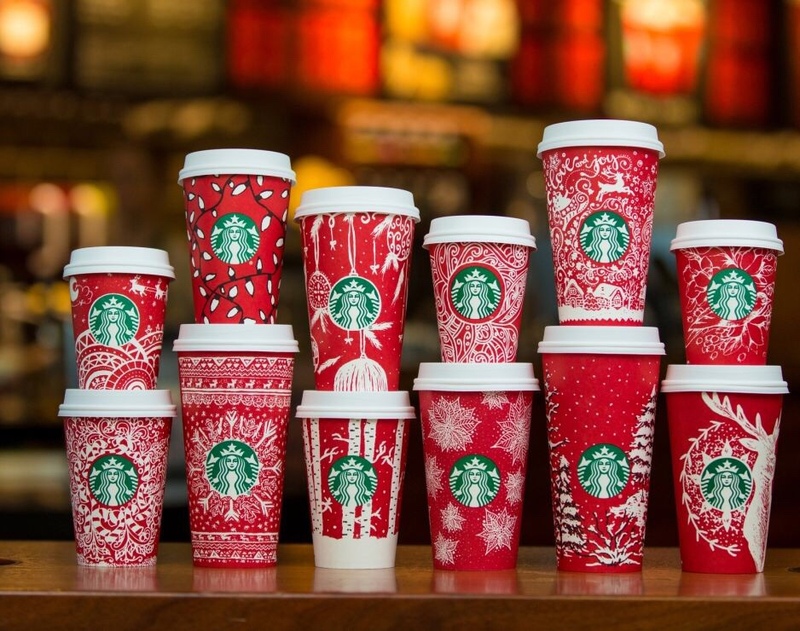 A popular user generated campaign the past few years is the Starbucks #RedCupContest that promotes its seasonal beverages. Users doodle and design on their cups and submit pictures on social media. This not only brings awareness to Starbucks itself, but also brings the customers a sense of connection to the company. Many advertisers are now moving away from websites and presenting themselves almost exclusively on social media platforms like Facebook and Instagram. This shift to social media can be attributed to the popularity of smartphones in our modern day society, which users spend more than 4 hours a day on. That being said, it’s important to turn your attention to your mobile site. The rise of smartphones has led to an extreme decrease in traffic to desktop sites, making mobile sites the big money maker. It is probably worth it nowadays to invest some time into making sure your mobile website works just as good as your desktop website. There are a number of other trends that have appeared after the creation of the smartphone. Take for example, the rise of video advertising. As of this year, YouTube is the second most popular search engine in the world. From a business perspective, you can definitely utilize a powerful resource like this. If that wasn’t enough to convince you, consider the fact that 80% of all online traffic in 2021 is predicted to be video traffic– or that more than 80% of consumers can remember the videos they’ve watched online in the past week. Currently, we recommend keeping a close eye on your social media, as it carries your greatest potential for success. Blog and video platforms are also great tools for increasing awareness. Why is all of this important for you to know? You’re probably already familiar with how fast paced this field is, but are you really prepared for the next big change? Marketers should be comfortable with a wide range of techniques and tools and should have the ability to adapt quickly to a new trend. Doing this will allow not only the creator, but also the company to succeed and bring in big money. For more information on the history of advertising, check out this post from medium.